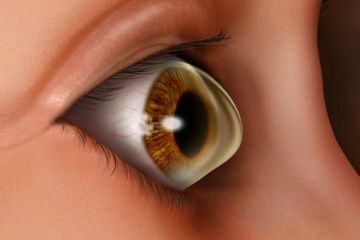 Keratoconus is a disease that affects the human cornea. It is a disorder of the eye which results in progressive thinning of the cornea. This may result in blurry vision, double vision, nearsightedness, astigmatism, and light sensitivity. Usually both eyes are affected. In more severe cases a scarring or a circle may be seen within the cornea. While the cause is unknown, it is believed to occur due to a combination of genetic, environmental, and hormonal factors. About seven percent of those affected have a family history of the condition. Proposed environmental factors include rubbing the eyes and allergies. The underlying mechanism involves changes of the cornea to a cone shape. Diagnosis is by examination with a slit lamp. Keratoconus affects about 1 in 2000 people. It occurs most commonly in late childhood to early adulthood. While it occurs in all populations it may be more frequent in certain ethnic groups such as those of Asian descent. The word is from the Greek kéras meaning cornea and the Latin cōnus meaning cone. Topographical maps of the cornea are generated by one of the methods called Placido Ring Projection. In this process, concentric rings with alternate black and white circles are projected on to the cornea of the subject. The image of the cornea with projected pattern is captured and then analysed to generate a topographical map of the cornea. Clinicians then use this map to subjectively classify if the patient is suffering from Keratoconus or not. In this classification, several numerical parameters are also used. We've developed a comprehensive web interface to accept the topographical scan from the user and pass the image through an advanced architecture of a convoluted neural network based on TensorFlow. This neural network has been trained for over 2000 images and classifies the scan into two categories with an average accuracy of over 97%. Alongside we've also developed an interface to demonstrate the journey of this image through the neural network and it's activation maps. The idea is to understand how the network classifies the image and use that information to help the clinician predict if a person suffers from Keratoconus. Apart from this, the interface also sports a comprehensive image analysis showing the Area, Perimeter and individual component analysis for each dioptric colour. We've also added an optical character recognition system built on the Tesseract model to show relevant numerical data from the topographical scans. Join us in this quest for diagnosing and grading Keratoconus. Dr Jagadesh Reddy : Specialist Cornea & Cataract. Clinical Mentor.